Between 16-21 September, 9,815 participants from 98 countries, representing governments, utilities, academia, private companies, and international organisations, came together at Tokyo Big Sight (Tokyo Exhibition Centre) to participate in a strategic platform discussing and co-creating solutions to our global water challenges at The International Water Association’s World Water Congress and Exhibition. The high profile and dynamic week kicked off with the presentation during the opening ceremony of the IWA Women in Water Award to Professor Akissa Bahri. This was followed on day one of the conference by the launch of a new strategic partnership between the IWA and the Chartered Institution of Water and Environmental Management (CIWEM) – representing a combined membership of 20,000 professionals across 139 countries. IWA and CIWEM’s announcement highlighted the crucial role of partnership and cooperation, as well as communication, in successfully moving the water and environment sector forward in the face of numerous challenges and uncertainty. Responses to these include a huge focus on resilience and this was a massive theme underpinning a large number of keynotes, plenary presentations, workshops, technical sessions, posters, forums, master lectures, training and development sessions and field trips. With so many parallel sessions and activities, it was impossible to attend everything, so I only give a snippet in this blogpost. 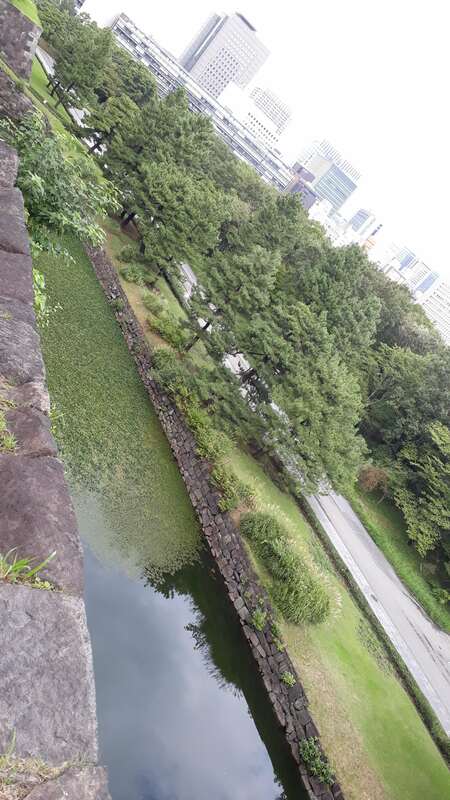 I also report on some of the travels I took around Japan whilst there – learning and developing knowledge and reflective practice doesn’t just happen in conference centres! Arup launched their ‘Cities Alive: Water for People’ report, which takes a human-centred approach to rethinking the need for whole-basin resilience – linking the urban with the rural. Whilst this human-centred focus comes across in the document, during a session titled Resilience in the Round that I convened on behalf of IWSN and partners on the Wednesday afternoon, it was interesting that Arup’s Global Water Leader, Dr Mark Fletcher, seemed to suggest that the role of equality and fairness (crucial for sustainable development and meeting the SDGs) should not be overstated when focusing on the socio-cultural and socio-economic aspects of designing and implementing blue-green-(grey) infrastructure for urban resilience. This seemed contradictory to recent research we’ve undertaken through the IWSN at UWE’s Centre for Water, Communities and Resilience (CWCR), which examined the role of appropriateness and inclusivity in blue-green infrastructure schemes and found there can be negative impacts for lower income or minority communities. 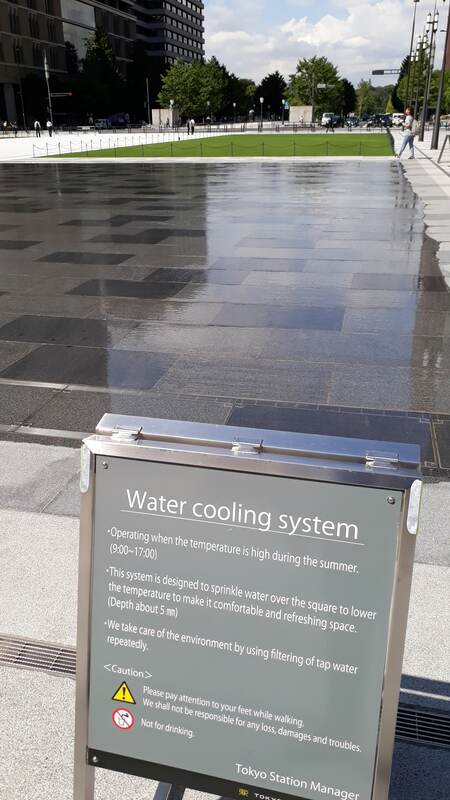 Karen Rouse of Water Research Australia supported this viewpoint, mentioning that the benefits of green-blue infrastructure-led or gentrification projects may not be fairly distributed across different recipient communities. This also echoed new approaches to social benefit indicators and monetisation being explored by consultancy Ramboll – I was fortunate to hear a presentation on this by Trine Stausgaard after stumbling into one of the business forums happening over lunch in the extensive exhibition area. This again resonated with work we have been undertaking in the CWCR on social impact assessment in engineering and resilience assessments, which should be published in 2019. In both the session and forum, we ran out of time to consider and debate these topics further, but will hopefully continue these important discussions after the conference to further emerging research and practice in this area. Other introductions, demonstrations and debates happening in our Resilience in the Round session included the Global Resilience Analysis tool, recently launched by the Safe and SuRe project team at the University of Exeter’s Centre for Water Systems; Anglian Water’s framework for operationalising resilience; and the Japan Sewage Works Association’s highly novel approach to learning and building capacity after disasters or extreme events occur: by getting employees to write essays about what went wrong as well as what went right. We’ll be following up with this work in the coming months as it provides an excellent opportunity for international knowledge exchange on institutional processes for enhancing organisational resilience. Key messages from the session were formulated by the IWA Young Water Professionals’ rapporteurs and will be available on the conference website soon. Picking up on other themes from sessions attended by myself and colleagues, there was substantial energy generated by Tony Wong’s session on integrating nature-based solutions for water in urban water infrastructure, and the two policy charrette sessions led by Paul Brown. The format of the latter was to look at all the challenges and opportunities in shaping our water future and then use participants’ imaginations to formulate an outline of the new types of policy they envisaged being required to address challenges and capitalise on opportunities. 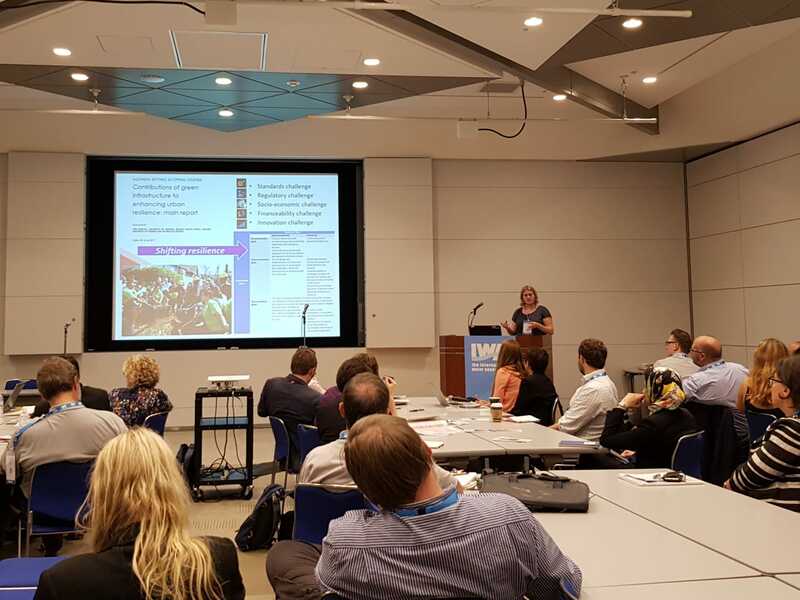 Other sessions covered everything from drought to water access, through microbial ecology to groundwater management, across to sensors and smart pumps, pipes and customer tariffs (and everything else in between). As well as participating in the conference I also visited several other locations. In 2009, I attended the 2nd International Conference on Rainwater Harvesting in Tokyo, which included a visit to the foundations of the Tokyo SkyTree (which was finished in 2012), as it has rainwater harvesting tanks built-in. It was amazing to return to the same spot almost 10 years later and see such a vibrant area developed around an impressive infrastructure project that actually has a remarkably discrete footprint. As well as Tokyo, I was fortunate enough to visit the cities of Fukuoka, Nagasaki and Kyoto whilst in Japan. Nagasaki, infamous due to it being the place where the second atomic bomb was detonated during World War Two, was a particularly sombre highlight. Even here, amongst the Hypocenter Park, Bomb Museum, Peace Memorial and Peace Park, the importance of water could not be ignored. In the first moments after the bomb delivered vast death and destruction, those who were not killed outright crawled down to the river or begged other survivors for water to drink. Today people leave offerings of water in various vessels, and fountains, pools and other water features dominate these memorials. There was also hope conveyed in many forms, including through meeting Mr Inosuke Hayasaki, who introduced himself and explained that he campaigns for peace through the Nagasaki Foundation for the Promotion of Peace – he himself an A-bomb survivor who had been working at the nearby Mitsubishi Arms Plant on the day of the explosion. At the harbour in the evening, I was treated to a cultural procession, demonstrating even further that Nagasaki is a vibrant, evolving city where tradition and the past meet innovation and the future. Kyoto was also special, as it is the old capital of Japan and has an incredible number of temples and the infamous Gion district, where, if you’re patient, you may see a Geisha making her way to or from work. Of course water wasn’t far from my mind, as there was torrential rain whilst I was there, which afforded me some time to think about water management at temples and how one could do with a rainwater harvesting or sustainable drainage system below one particularly (to me) problematic downpipe! A local tour guide who introduced himself over lunch provided a useful tip on not visiting Kyoto’s castle (not much of it is left), so instead a venture to a local flea market afforded ample opportunity to browse all sorts of stalls, in the grounds of another temple with ponds and an extensive moat. 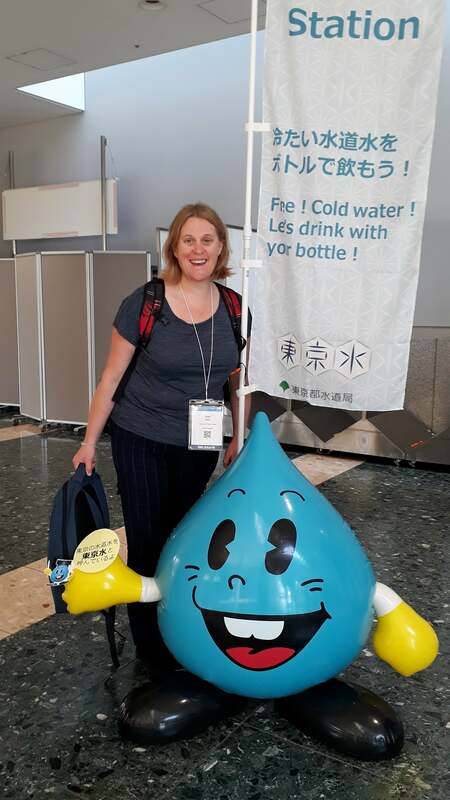 All of these experiences illustrated the importance of relationships, old and new, with water in Japan and internationally – reflecting the importance placed on shaping our water future, which hopefully everyone who attended the Congress will continue to actively strive for. See the conference in (a lot of) pictures here.